This Hoffman 10" Powerline boot is for lineman who work in warmer temperatures or for those of you who want a lightweight climbing boot with all the bells and whistles. The Hoffman EH Compostie Toe Powerline offers a water-resistant liner and many features found on their other line boots. A double midsole combined with their DUAL STEEL SHANKS provide plenty of climbing support. A rebuildable Vibram lug sole provides excellent wear and a added climbing heel adds climbing safety. The leather and Cordura upper provides breathability to help keep you cool. A foot orthotic is included with every pair. NOTE: The Powerline has a water-resistant liner. Although liner failure is rare in the construction of this boot, Hoffman Boot will NOT warranty the waterproofness of this boot. 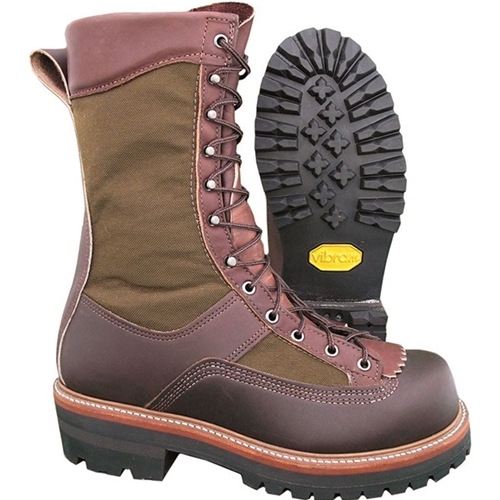 Hoffman 10" EH Powerline Composite Toe Boot has a rating of 4.9 star based on 39 reviews.